The process of passing and implementing a law is a long and winding road, but President Obama’s Healthcare Reforms cleared a significant hurdle on Thursday when the Supreme Court upheld most of the law as constitutional against challenges from many of the states as well as business organizations. You have probably been getting a lot of questions from employees, patients, friends and relatives, and even your providers and colleagues, and they all basically boil down to this: How does the law affect me? As Managers and Administrators, one of the most basic ways you influence outcomes for your employees, your patients, and ultimately, your organization is to be informed, and to inform others. Can you give a basic overview of the law that was passed to a worried patient? Have your staff gotten any information about handling patient questions? Do your providers have a basic idea of how the practice will respond to the changes? Many states and organizations have been delaying plans for the changes in the PPACA because of the court challenges to the law (many were plaintiffs in the suit) or for this November’s elections, which could put a President in the White House who has promised to repeal the law. On top of that, even if President Obama wins another term, a Republican-controlled Congress could choose not to fund certain programs so that the law could not be put into place. For the moment however, the Affordable Care Act is the law of the land for the immediate future, and something all managers need to have a basic grasp on. The goal of the legislation is to decrease the number of uninsured people in the country by tweaking existing federal programs like Medicaid and Medicare, and issuing new regulations on the health insurance industry as well as on private businesses and individual citizens. 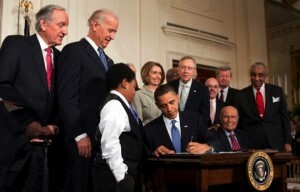 By the year 2014 everyone will have a responsibility to carry some kind of health insurance. If you don’t get healthcare coverage through your work or your family, or through an existing program like Medicare, Medicaid, or Tricare, you will have to purchase a minimum level of private insurance or face a penalty. Subsidies to help pay for the required insurance will be available to individuals and families who make up to 400% of the poverty level on a sliding scale. One example from Wikipedia, of how that would work in real life: A family of four whose income is at 150% of the Federal Poverty Level (~$34,000 a year) would be subsidized so that their monthly premiums would be about 2% of income, or $50. To further help individuals comply with the mandate to have insurance coverage, by 2014 each state will set up a Health Insurance “Exchange” a marketplace where individuals can compare benefits and premiums for health insurance, and find out if they qualify for federal subsidies. Are My Taxes Going Up? In addition to the individual mandate, in 2013 people with income $200,000 a year or more ($250,000 a year for couples) will have their Medicare Tax increased from 1.45% to 2.35% on the income above the limit. The Medicare Tax on Net Investment Income over the $200,000 limit will be raised from 2.9% to 3.8%. These increased Medicare taxes on high income individuals account for roughly half of the new income to pay for the bill. Other new taxes on individuals include a 40% excise tax on “Cadillac Plans” or insurance plans that cost more than $10,200 a year for an individual ($27,500 for a family) starting in 2018, and a 10% sales tax on tanning services that began in 2010. New restrictions will also be placed on Healthcare Savings Accounts and Medical Expenses taken as tax deductions. Although people will be required to carry some form of policy, new regulations on insurance companies should increase the overall benefit to the private citizen for purchasing coverage. For example, insurance companies can no longer deny (or overcharge for) coverage to people with pre-existing medical conditions, cannot drop someone’s coverage who becomes ill, and cannot impose either lifetime or annual caps on how much a policy will pay out in benefits. Insurance now also has to pay for basic preventative care like wellness visits without co-pays or deductibles, and children can stay on their parents’ insurance until their 26th birthday- even if the child is not a financial dependent, or is married. Insurance companies also have to adhere to a “Medical Loss Ratio”, which means that they have to spend a certain amount of the money they collect from your premiums on either medical services or quality improvement. Every year the insurance companies must report how much of the premiums they collect are spent on these medical losses, and if they spend less than the ratio (80% for individual and small group plans, 85% for large group plans), the difference is refunded to the policyholder. Federal Health Plans Medicare and Medicaid will also be changed. Medicare enrollees who hit the “donut hole” in the prescription drug benefit receive a 50% discount on covered name-brand drugs, and the benefit will continue to increase until the “donut hole” is completely closed in 2020. Also, federal money will be made available to the states to expand Medicaid coverage to anyone who makes up to 133% of the Federal Poverty Line. At the time of this writing, the governors of two states, Florida and Louisiana, have already indicated that they will not take the additional Medicaid funding from the federal government. As Managers, Providers and Employees, what are some of the questions you’ve been getting about the ACA, and how have you been answering them? Thanks so much for the break-down on the healthcare reform Act. Thanks Sheila – So glad you liked it! I think there is an error in the last paragraph. This sentence should read, “Also, federal money will be made available to the states to expand MEDICAID (not Medicare) coverage to anyone who makes up to 133% of the Federal Poverty Line. You are spot on. Thanks for catching that!